Fort Collins is growing as shown in this residential neighborhood. The Rocky Mountains are in the background. Looking to relocate? 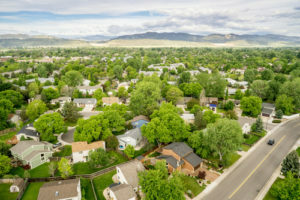 MoveBudda lists Fort Collins, Colorado as the second most popular place to relocate. TDS, your internet service provider, offers speeds up to 600Mbps in the booming Colorado community of Fort Collins. It only makes sense that Colorado’s craft brewery capital is a town people want to live. Fort Collins has a variety of festivals running year round, local music is everywhere, and because of its location at the foothills of the Rocky Mountains, there’s always something to do outside. Colorado State University (CSU) is located in Fort Collins, providing the perfect balance of academics and recreation to its students. It’s also home to the Annual Flower Trial Garden from May through October to educate students and residents alike on horticulture research. Thousands of flowers are planted each year and studied. The garden is open each day and is free to the public. Fort Collins is home to 22 breweries, including New Belgium Brewing Company and Odell Brewing Company. Anheuser-Busch has a brewery and houses the famous Budweiser Clydesdales here. It also hosts Colorado’s Brewer’s Festival which features more than 40 Colorado breweries and 90 beers. Attendees can even attend “beer school” for the day to learn brewing tips and experience tastings and demonstrations. Last year, National Geographic named Fort Collins as the fourth happiest city to live. Old Town Fort Collins was placed on the National Register of Historic Places in 1978 and named a Preserve America city by the White House in 2005. The area is filled with historic attractions, including Mishawka, a dance hall turned-modern day concert venue. The downtown area of Fort Collins is both magical and spooky. It’s known for its ghost stories, and you can take a tour led by actors clad in classic attire to hear all about the town’s secret scary stories. Walnut Street served as inspiration for Disneyland USA’s Main Street. For more history, take a tour of Avery House, the historic home of Franklin Avery, founder of First National Bank who was instrumental in agriculture projects in the 1800s. Sandstone blocks on the old quarry on a shore of Horsetooth Reservoir. 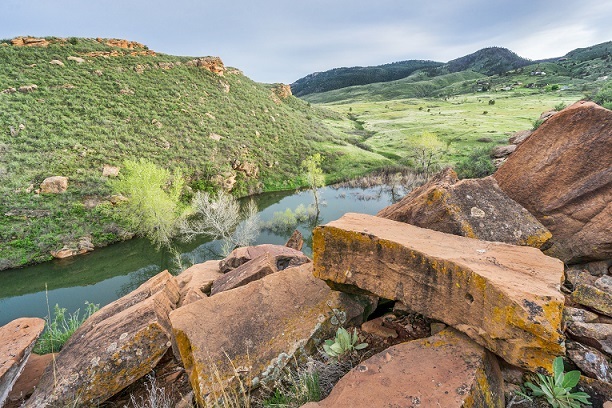 The view is of Mountain Valley in Lory State Park, Fort Collins. Just minutes outside of Fort Collins, the Horsetooth Reservoir was developed to water farms around the area in times of water shortages when the Poudre River wasn’t enough to meet demands. Now, the 6.5 mile-long reservoir is a popular water recreational spot. Directly west of the reservoir is the Horsetooth Mountain Open Space, where many enjoy hiking, biking, and horseback. One of the most notable hikes is climbing Horsetooth Rock, but visitors can ask any local for more trail suggestions. Another fun spot to venture to is the Cache La Poudre River which flows through Fort Collins, attracting fishers, kayakers, and especially white-water rafters. Notable people who were born in Fort Collins include Supreme Court Justice and NFL halfback Byron White and Napoleon Dynamite actor Jon Heder. Actor John Ashton, best known for Beverly Hills Cop and Midnight Run resides in Fort Collins. Colorado State University was home to many celebrities, including Thomas Sutherland, who was a professor of animal science there for 26 years. He was held hostage for over six years in Lebanon while working as the dean of faculty of agriculture and food science at the American University in Beirut. Temple Grandin is a professor of animal science at CSU, autism spokesperson and her life was featured in the movie Temple Grandin. Amy Van Dyken-Rouen is a CSU alumna and four-time Olympic gold medalist.